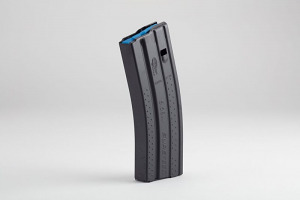 OKAY Industries Surefeed 30RD AR15 Magazine - BLK PTFE - E2. This Okay Industries Surefeed magazine is designed for use with 5.56 mm/ .223 caliber ammunition and will fit/function in AR-15 style firearms that meet military specifications. plan and simple they are great not much more to say. I read a review about the top rated AR magazines a couple years ago and being that I live in Kalifornistan I didn’t pay anymore than a passing interest. I did however remember the magazine that topped the list - the OKAY magazines were considered the best of the best. A short while ago, those of us behind enemy lines here experience a small bit of liberty during Freedom Week. I could have ordered anything and remembering the OKAY brand led me to Top Guns Supply. I made my purchases and couldn’t be happier with the mags and Top Gun Supply. The mags are excellent and TGS was super easy to buy from and monster fast shipping. Thumbs up all around. Good job guys and thank you for taking care of us in Fucktardistan. Fast and efficient service, high quality product. A pleasure.